Hiring a hog roast machine is a wise decision to make, being that hiring a machine is the great tasting of hog roast catering and without all the additional costs that come with the service of a catered hog roast Colchester. But just because it’s lower in cost doesn’t mean it’s not as good, on the contrary, many who’ve used both have found the food they’ve cooked more enjoyable. Not because it necessarily is—though who are we to say—but just as much because of the enjoyment that comes from doing it yourself. It’s been understood for a while now that when you do something yourself you get much more pleasure from the end result, and hog roasting is no exception to that, if anything hog roasting is the best evidence for that! Because pleasure is something you’re going to get by the bucket-load if you hire a machine and cook a hog roast Braintree yourself. 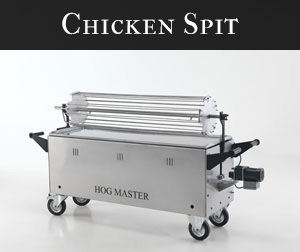 The machines that you can hire from us are capable of cooking most foods, the significant of these, the reason you would want to hire a Spitting Pig machine is the spit roast is chicken, pig, beef, turkey and anything that can be spit on our skewers, actually. These are what we call the core foods, the meats, whole and cuts, which can be spit roasted with the machine. The machines also offer up a few more interesting functions though. We’ve put a significant amount of work into the machines, in terms of design and utility. An important development of the spit machine, our break through, was to incorporate ‘normal’ cooking with hog roast cooking. With a Spitting Pig machine you’re in a position to spit roast whole meats, at the same time there’s a grill in (some) of our machines which can cook anything that you could grill in a household grill. The grill can also be removed with the heat sourced then being able to be used to cook foods in stainless steel pans. Whether you use the stainless steel pains to boil potatoes or rice, or fry or steam vegetables. The possibilities aren’t literally endless, but there are enough of them to keep you busy for a few years of hire! 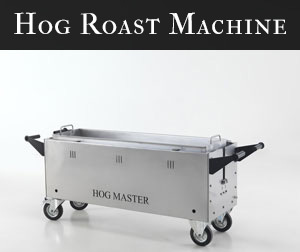 Ever wanted to own your own hog roast machine? Our machines are hand made here in the UK and are built to the highest standard. These machines are perfect for caters looking to offer something special to their events. 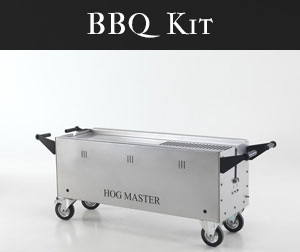 Get your hog roast machines from our dedicated website and start cooking your very own hog roasts. Get in touch for details. A Spitting Pig machine can be hired for as for a day for a hog roast Chelmsford, alternatively you could hire the machine for a week. Or if you’re like many of our existing hog roast machine clientele you can hire machines on a monthly basis for or for an ongoing period at a negotiated price. If you’re hiring a machine for a one-off event then this probably wouldn’t interest you, but as many of our customers are themselves well-established caterers and restaurateurs it’s a fantastic offer, ideal if you don’t have the money to buy a machine in full, or want to thoroughly test the waters and a month’s hire just doesn’t cut it. Whichever machine you do hire, all of them are compatible for indoor or outdoor use. In summer, weather permitting, there’s nothing to rival a succulent hog roast under the blazing sun. Having a hog roast in the great outdoors is the oldest way of enjoying a hog roast and if you ask us it’s the best, a hog roast Epping with a side of fresh air and a beer in hand is one of life’s greatest pleasures. If you can’t have the hog roast outside because of miserable weather or because it’s just not applicable for your plans then you can just as easily cook a delicious hog roast inside. Spitting Pig machines are powered on gas – we’ll give you a bottle for free – and can be used inside just like any other oven, just make sure that the venue is well ventilated! If you aren’t sure whether it is or isn’t, don’t worry, we’ll let you know if your venue is suitable for hog roast machine cooking. We’ve saved the most important bit for last, and we get this from so many interested people, the question of whether or not they have the skills to hog roast, to that our answer is a resounding yes! A hog roast machine isn’t difficult to use, in the least, and that’s why so many love Spitting Pig hire, because anybody can hire and create the best hog roast Harlow food.